Here is a more extensive biography. 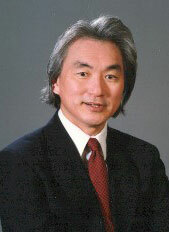 He is a professor of Physics at City University of New York. His most recent book is Physics of the Impossible: A Scientific Exploration Into the World of Phasers, Force Fields, Teleportation, and Time Travel. He has been instrumental in promoting the Kardashev Scale, which is a method of categorizing civilizations into one of three types. A Type 1 Civilization is capable of harnessing all of the power available on a single planet. A Type II Civilization can harness all of the power available from a single star. A Type III Civilization can harness all the available power of a single galaxy. On that scale Earth's 'civilization is at .718.